Bass drum heads play a huge role in the sound of the bass drum. While many focus almost exclusively on batter heads, resonant heads are just as important. 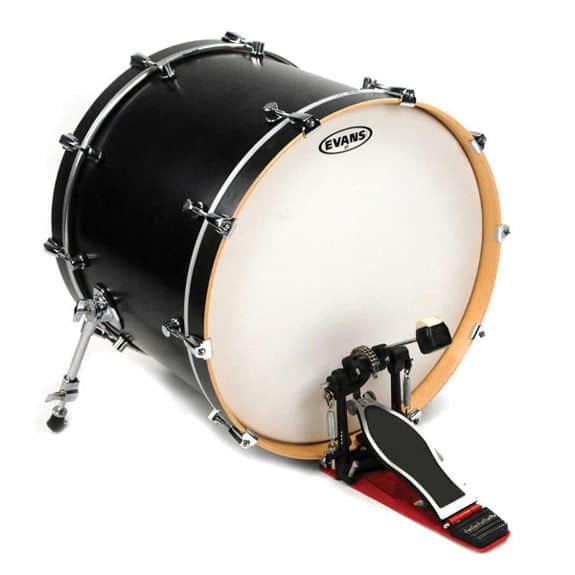 To find the right bass drum head for you, you will have to know what type of sound you’re trying to get and the type of music you’ll be playing. Let’s take a closer look at the best bass drum heads on the market. 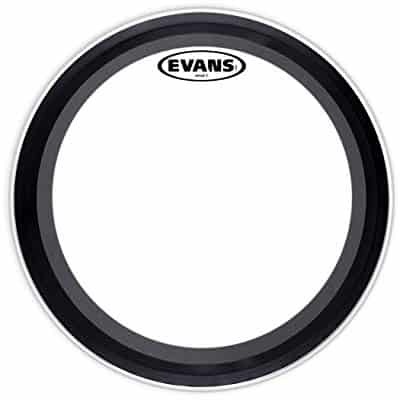 If you need a drum head that covers the entire spectrum from country and blues to hard rock and metal, you might want to give the Evans EMAD2 22” Bass Drum Head a chance. The Evans is a batter head with a 10mil inner ply and 7mil outer for increased durability. It is made with Evans’s proprietary Level 360 levers that allow for a wide tonal range and easy positioning. The head also features two damping foam rings. Get the thinner ring for more punch and focus without losing too much resonance. Or the thicker foam for tighter bass and a stronger attack. Single-ply coated bass drum heads are very popular among drummers who prefer a strong and resonant sound. If you’re playing modern jazz rock fusion, rock, blues, or R&B and funk, you should check out the Remo Ambassador. It is a single-ply coated bass drum head with a distinctly bright attack and recognizable tone. You’ll get controlled sustain both on stage and in the recording studio. This head sounds open and loud with lots of clarity. The head is coated with a single 10mil ply that’s on the thicker side. You can use it as both a batter and resonant head, as many professional drummers do. The Ambassador is not the best option if you want a dark tone. 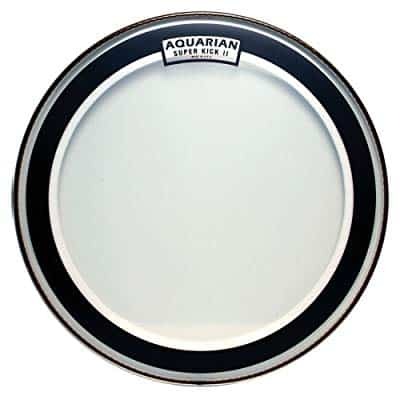 The Aquarian Drumheads Super-Kick II is for drummers who prefer double-coated batter heads. 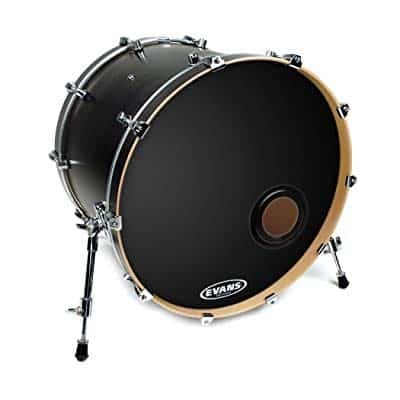 It comes installed with two 7mil Nu-Brite drumhead film for extra strength and durability. The dual coats also make this batter head sound more focused particularly in terms of a strong and well-rounded low end. The Super-Kick II has a dense attack, very few overtones, and a resonant, full sound. If you dig the thunder of John Bonham’s kick drum, this might be the right batter head for you. On the other hand, if you want something with a lighter, snappier sound, you should go for a one-ply head. Thanks to the floating muffling system, the Super-Kick II has a pre-dampened but quite natural sound. The felt it uses breathes and moves together with the batter head. Aquarian offers this batter head in a range of sizes. The best way to reduce the noise while practicing drums is to play on an electric drum kit. However, if that’s not your style, then you might want to consider switching to silent drum heads. If that’s the case, make sure to check out the Remo Silentstroke Bass Drumhead. The Silentstroke Bass Drum Head is part of the larger Silentstroke series that also covers snare and tom heads. This drum head looks and works like your normal kick drum head. The only major difference is that it produces a lot less noise, making it the perfect practicing partner for drummers who are reluctant to go electric. 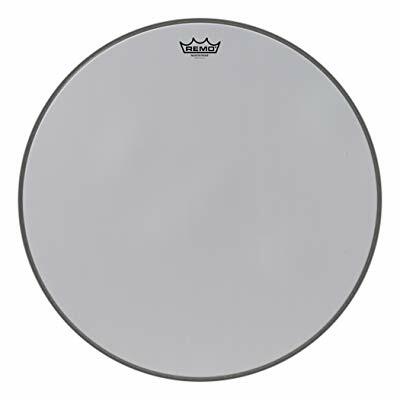 This drum head is made of a single-ply mesh that’s designed to significantly muffle the tone. It is easy to set up and tune and it works great with electronic triggers. A vast majority of drummers use one-ply coated resonant bass drum heads, as they’re the most versatile option out there. If a single-ply resonant head is what you’re after, check out the Evans REMAD Resonant Bass Drum Head. The Evans REMAD heads are based on the popular EMAD batter heads and tend to sound best in combination with them. However, the REMAD heads also have an internal fixed ring for controlled overtones. This one in particular feature a 4” offset microphone port, which has a plastic sleeve for improved pitch focus and protection. It also enhances the attack of the kick drum and gives it a studio-ready sound. You can pair this resonant head with clear 1-ply and 2-ply batter heads and use it for pretty much any style of music. Bass drum heads are made with either 1 or 2 plies of mil film. The 1-ply models are available as clear and coated, while the 2-ply models are exclusively coated. 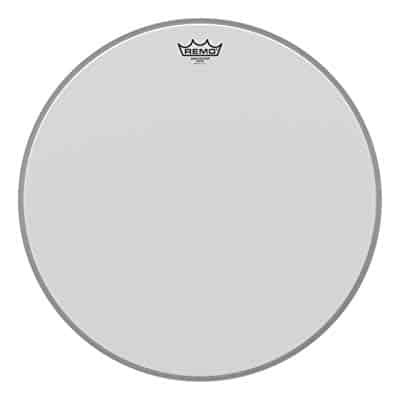 Clear 1-ply heads have the brightest and most resonant tone of all bass drum heads. They’re mostly made with a single 10mil layer. If you want a lot of decibels, sustain, ambiance, and overtones, go for a clear 1-ply head. Coated 1-ply heads have a slightly punchier and warmer sound than the clear variety. Owing to the coating, they vibrate slower which results in lower overtones. If you’re into soul, pop, funk, jazz, rock, or R&B, go for this variety. Some consider them the standard due to their versatility. Owing to the double-layer construction, 2-ply drum heads are more durable than their 1-ply counterparts. They also have a stronger attack, few overtones, and a resonant, full voice. If you’re into heavier music, a 2-ply drum head is the way to go. Pre-muffling is used to dampen the tone of the drum head. Back in the day, before Remo and Aquarian made the first pre-muffled heads, drummers used towels, pads, and pillows to give bass drums a tighter, punchier sound. Nowadays, all major manufacturers make their clear and coated heads in both standard and pre-muffled variants. Similar to their standard counterparts, the brightness, sustain and attack of a pre-muffled head depends largely on the number of plies and coating. Until the 1950s, calfskin was the only material used for bass drum heads. They give a darker tone with lots of sustain and a rounder attack. However, everything changed with the introduction of Mylar, a type of polyester film trademarked by DuPont. However, due to popular demand, Remo and Evans started making vintage-style heads again in the mid-1970s. While Remo developed a treatment process for their standard heads, Evans came up with a synthetic material named Calftone. Today, all major manufacturers have bass drum heads for players who want the warmth and sustain of the classic calfskin heads. Resonant heads play a big role in the overall sound of the bass drum. They’re available in all three main varieties like batter heads. Also, some models feature mic holes. 1-ply heads will add brightness and ambiance, depending on how they’re tensioned. Expect clear heads to be brighter than their coated counterparts. 2-ply heads have shorter sustain than standard 1-ply heads. They also have more resonance than 1-ply heads with muffling rings. Heads with small, offset mic holes won’t interfere with the drum’s tone much. However, the ones with large center holes will shorten sustain and increase the punch of the drum. The choice of the right bass drum head should depend on the style of music you want to play and the tone you want to achieve. 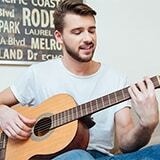 If you want a bright and lively sound, go for a 1-ply head. If, on the other hand, you want an aggressive and darker tone, 2-ply heads are the way to go.